Practice Bioinformatics questions and answers for interviews, campus placements, online tests, aptitude tests, quizzes and competitive exams. This set of Bioinformatics Multiple Choice Questions & Answers (MCQs) focuses on “Dot Matrix Sequence Comparison”. 1. Which of the following is not a software for dot plot analysis? Explanation: For the purpose of dot plot interpretation there are various softwares currently present. Among these SIM is used for these kinds of alignments through dot-plot method that is wrongly abbreviated. 2. The softwares for dot plot analysis perform several tasks. Which one of them is not performed by them? Explanation: The gap penalties mentioned above are for the determination of score of the aligning sequences. The change in residue barely takes place as there are number of other softwares for that purpose and also the main objective is to find the score of the alignment. 3. For palindromic sequences, what is the structure of the dot plot? Explanation: For perfectly aligned sequences there is a diagonal formation of dot plot. For palindromic sequences i. e. for sequences that are symmetrical from the midpoint of the sequence, there exist 2 intersecting diagonals on the plot. 4. For significantly aligning sequences what is the resulting structure on the plot? Explanation: If there is alignment of sequences there is a significantly bold diagonal visible on the plot. And if the is a bit imperfect, the diagonal is shattered too to an extent and forms small parallel lines to it. 5. When was this method, first described? Explanation: This method was first described in 1970. Briefly, this method involves constructing a matrix with one of the sequences to be compared running horizontally across the bottom, and the other running vertically along the left-hand side. 6. Who were the inventors of this method? Explanation: The first computer aided sequence comparison is called “dot-matrix analysis” or simply dot-plot. The first published account of this method is by Gibbs and McIntyre (1970 The diagram, a method for comparing sequences. Eur. J. Biochem 16: 1-11). 7. Which of the following is true for EMBOSS Dottup? Explanation: The EMBOSS Dottup doesn’t allow you to specify threshold but allows you to specify window size. Also, if all cells in the window are identity, it colors in all the cells in the window. 8. Isolated dots that are not on the diagonal represent exact matches. Explanation: Those isolated dots represent random matches. The dots on the diagonal represent the perfect alignment and the dots with vertical and horizontal shifts show insertions and deletions. Explanation: Deletion and insertion of nucleotides is quite common in alignment process. The dot plot easily represents them with vertical and horizontal shifts. And the mutations are totally out of the diagonal zone. 10. Dot plot of repeating elements would be small crosses on plot. Explanation: The repeating elements would be represented in parallel lines in repetitive manner. Better is the repetition; better is the nature of parallel lines. Also, the intersections show the pallindromic sequences. Sanfoundry Global Education & Learning Series – Bioinformatics. 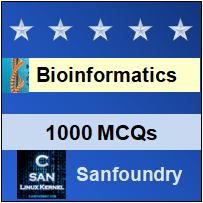 To practice all areas of Bioinformatics, here is complete set of 1000+ Multiple Choice Questions and Answers.